T: Let’s talk about your other 2 new projects related to Tenchi.K: Well, it is “NEW” but both use the view of world in “Tenchi Muyo!”. One of the projects is little different, though. T: How about the “Galaxy police”? The title makes me feel like it has a lot to do with the world of Tenchi. K: Most of the characters are from the novel of “Galaxy police”. If you read the books, you will have better understanding of this new Galaxy police animation. “Tenchi Muyo!” has a deep background. Such as, Jurai and the “Academy”, but “Tenchi Muyo!” only focusing on what happened around or in Tenchi’s family. T: It means that you are going to choice one “stage” in the background of Tenchi and make it a anime series. There are 2 Galaxy police members in Tench–Mihoshi and Kiyone. Will those characters in Tenchi show up in Galaxy Police? K: No. Not many characters in Tenchi will show up in Galaxy Police. T:Will some people related to Mihoshi show up in the show? K: Mihoshi’s mother. One character in the novel-“Ally Maguma”. The grand mother of Aeka and Sasamy-“Sedo”. K: All I can say is, That is my anime world and I have no plan to change my original design. T: I think people will understand more about Tenchi’s background by watching Galaxy Police. Do you have any ideas that how are you going to entertain the audience ? K: Originally, I want many writers use the back story and create “Tenchi” world together. Like RPG games that writers can change the storyline as long as they are not interfere the main storyline. T: I see. So, what exactly do you want “Galaxy Police” become? K: I simply want it become an adventure comedy. The leading male character in Galaxy Police is a young male human being named “Seina”. He is involved in many things as Tenchi. A girl who is the best friend of Tenchi’s relative misunderstand Seina as one of Masaki Family’s member and ask him to join GP. That is where the GP story start. T: So, will Seina be involved in unexpected situations even though it’s just due to a misunderstanding? K: Seina received a Galaxy Police Academy pamphlet with an application form in it. He filled it out without knowing what would happen. The next morning, when he wakes up, he’s somewhere in middle of the universe. He’s confused, scared, but also excited that he can explore the universe. T: Is he the “hero” and does he play an active role in the story? K: Seina is very unlucky. His fortunes are just like Mihoshi, they always turn in the wrong direction, which leads to an unfortunate ending. For example, on the way to the Galaxy Police Academy space pirates attack him. SOMETHING Because of his “luck” he is assigned to a special GP captive team, the “home delivery” troop. T: And many dramatic stories will result from his bad luck? K: Yes, that’s correct. Also, Mohoshi’s mother, who is quite attractive, will appear quite often. Seina will be surrounded by attractive women, but will not end up in many romantic situations. T: But, much of the anime surrounding “Tenchi Muyo!” are male fantasies come to life. It’s fun to imagine, but would never happen in the real world. T: Will Galaxy Police (abbreviated as GXP for the rest of the interview) turn up the tension level heading into the climactic ending? K: The GXP storyline is like “Tenchi” in that it is “flat” throughout. But, there will be a big twist at the end when Seina is missing. T: Will that twist create a connection with all of your previous work? T: So we won’t know what the twist is until we see it at the end? Is it like a gift to Kajishima super fans? K: If you put GXP and Tenchi Muyo! Ryo-ohki in order; GXP’s time frame takes place a year after Tenchi Muyo! Ryo-ohki. The audience may be confused as to why certain characters show up in GXP. T: But GXP will be released before Tenchi Muyo! Ryo-Ohki 3rd OVA, right? Oh, I see, it’s like Star Wars, where you’ll release the latter episodes first. K: I want to put in some fun for those who watch GXP. It keeps them guessing, “What is this character doing here?” “Will this character be…?” Then have the secrets unveiled in later episodes. T: I figure, if you spread the “secrets” around and let other creators join the storyline, it becomes limitless and could last forever. K: Sort of. For example, “Zero” is a regular character in “Tenchi Muyo! Ryo-Ohki” and “Space Opera”. T: I see. It a sense, it’s not directly connected, but connected in the Kajishima Universe. Allow me to change the subject here and ask you about the other new anime you’re planning- -“Seikishi Monogatari (=Saint Knight Story” *tentative). K: I’ll start by describing the difference between this new anime and the others; “Seikishi Monogatari” is not as deeply entrenched in the “Tenchi Muyo!” universe as “GXP”. The only connection is the family name of the main character, which is “Masaki”. I don’t think it’s necessary to hide who he is… it’s the story of Tenchi’s half-brother. I had this character in mind before I created the 1st Tenchi Muyo! Ryo-Ohki OVA. T: Really? Please allow me to change the subject again. What kind of Tenchi movie would you create if you had the freedom to do whatever you wanted? T: That would be something if they allowed you to make that into a movie! (laugh) Normally, people ask for something special in a movie, such as large-scale fighting or a romantic story. K: That’s true, people usually expect something big. But, basically, the Tenchi movies extend the Tenchi Muyo! TV series, right? My thoughts about the TV series are, they put Kiyone and Mihoshi together as a team, independent of the Tenchi family. 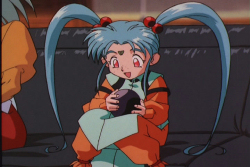 At the same time, the TV version of Kiyone will never care for Tenchi. I don’t quite agree with that particular TV version of Kiyone. She has the most “normal human” personality amongst the girls and I think she and Tenchi are the best match. T: Well, Tenchi Muyo! Ryo-Ohki stimulates people’s imaginations with a strong lineup of female characters, each with their own unique personality. Another reason it has attracted so many people is the fact that the female characters are so “real”, as if they are models in real life for each character. T: (Laugh). The “sense of life” in Tenchi also attracted many people. K: Is that so? I would have created something different if I had produced it when I was in my 20s. I had “Tenchi” story ideas when I was in high school. As a result, I kept it on the back burner for 13 years until I created it. T: Huh…then it’s the fruit of your youth? T: Back to new anime “Seikishi”, what is the highlight of that anime? T: Oh, so the worlds are created by “Gods” and there are differences between these “worlds” that cause the main characters to feel strange when they pass between them? Will the main characters be conscious of where they are and how to get back to where they came from? K: The main character is he finds a place of his own and someone who accepts him for who he is in the alternate world. Its similar to “Dual”. Originally, “Seikishi” story is on the same line as “Dual”. T: So, you’ve separated the story into two parts. Will “Seikishi” be released after “GXP” or will they be released together? K: “Seikishi” will be released after “GXP”. I want to concentrate on those three series, including Tenchi 3rd OVA, and it’s impossible for me to handle two at the same time. Especially in regards to Tenchi 3rd OVA, I can’t have other people produce that. T: So, the next three years will be spent on those three works? T: Yeah, especially if “Tenchi” becomes a very long running anime series. Coincidentally, right after the 1st Tenchi OVA series was released, “OVA” anime became the ground floor for many TV anime series. K: Speaking of the entire “OVA” industry, I think that it tends to run out of ideas. There aren’t many production companies like AIC that concentrate on an original story. The majority consider “OVA” as an extension of manga or a TV series, there aren’t many 100% original series like Tenchi Muyo! Ryo-Ohki in the industry. Nobody expected much of Tenchi at first. In that sense, it’s good to have so much freedom when producing an anime. T: It’s very rare to find work that combines a serious story with a strong sense of daily life. If we talk about Tenchi, we can’t help but mention “Onsen” (hot springs). It’s almost like a trademark of the Tenchi world. Hot springs have become a tradition in AIC’s anime. K: But it’s just like Director Oshii Mamoru always have his characters eating something in anime, such as the Japanese green noodles at the street stall in “Urusei Yatsura” or other works. I just have my characters having a hot bath as part of their ordinary daily routine. There is no way I’d create an inharmonious scene of people straddling a toilet in the bathroom as trademark in my work, it’d be like committing a crime. (laughs) It’s not a crime for males and females to have a hot bath together, right? T: I understand what you mean. Besides, it’s more convenient for you to insert scenes of naked people having a bath in a male-oriented anime. Also, the imagery of “hot springs” creates a relaxing, stress-free environment. K: Agreed. The only thing left to do after that is sleep. (laughs) When you travel, no matter where you go, you anticipate the time you will have to get to bed and have a good night’s sleep, right? Pillow fights and small-talk, I want to put those things in “Tenchi”. I think it’s possible to put things like that in the series, for it already has a label on it and if I don’t do it, it’s kind of a waste of my efforts. (laughs) But, before that, I have to settle a battle between Goddesses in the former half of the 3rd OVA. T: It seems like you’re looking forward to creating the latter half of Tenchi. K: Frankly, I want to make the latter half first, like, producing “One day in the life of Ryo-Ohki”. T: If that’s your goal, what you have been doing so far is a good head start. Sort of like, “I’ve worked hard for 10 years only to have the freedom of doing whatever I want do with Tenchi!” Now that we’re nearing the end of the interview, it seems like the message to your fans is to “surround yourself with the mountains of Kajishima and have fun”? K: Oh no, not on such a large scale. T: Well, how about the “Kajishima Hot Springs”? K: Sort of, I hope that my fans enjoy everything like a relaxing soak in a bathtub at the hot springs. Mr. Kajishima will like to show his appreciation here for fans around the world who has been writing to him after the 1st interview published online. Though he never been to other countries, he is glad to know that there are so many people interesting in his anime world. “Tenchi is not finished yet. I will keep working on it and thank you very much for your support. -Kajishima” . © AIC. All rights reserved.